Allen’s Horse’s Head is clearly ready for an exhibition in the professional photograph with Arthur Hammond lighting. In the earliest studio photo, the large, newly carved horse is a brightly lit ¾ shot, mounted on a block of wood. As it appears in the professional shot, viewed straight on from the side in high contrast, it is still on the block, made clear by the grain of the wood at the lower left. This photo has a very dramatic, grand feeling, perhaps “architectural” as the reviewer suggests. In the third and current photo, patinaed by age and handling, and shot at a different angle, the horse appears smaller. 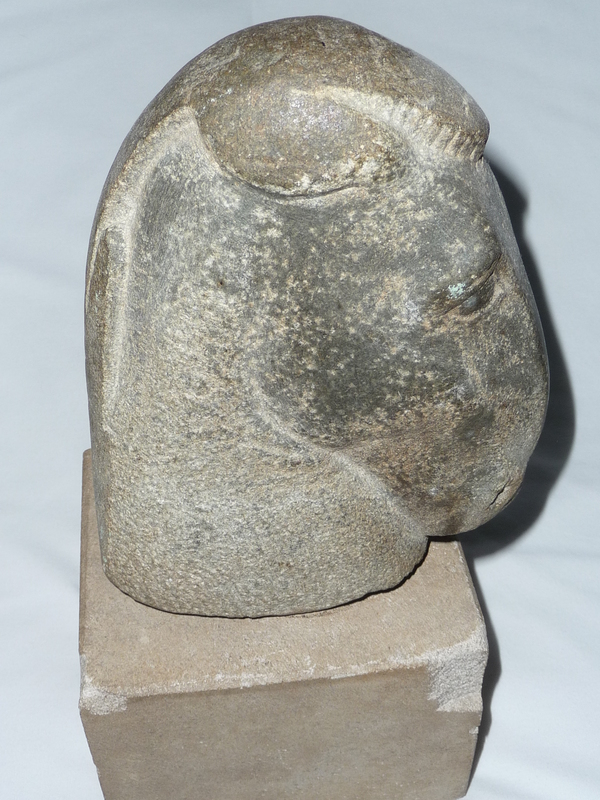 It is now mounted on the same size block, but in a cast stone material judging by the chip in the corner. Wood sometimes breaks down with a heavy stone. The sea-weathered shell of the stone is seen along the top of the head where the horse’s mane is suggested by the vertical cuts. The ears follow the mass of the skull. The face is smooth in texture and the light reflects off the flat plane formed by the line of the forehead and nose, all of which invites touching. Here, this horse waits in alertness, looking forward with its chin drawn in against its upright neck. The detail in the big soft eye draws you in to see how alive it is. The mere suggestion of the velvet skin around the wrinkled nostril lets you know there is no danger or effort, but rather a sense of curious attention. Rough chiseling colors the thick neck as it fades into the square base. It is modern and charming. There is a discrepancy in the published records of this exhibition. 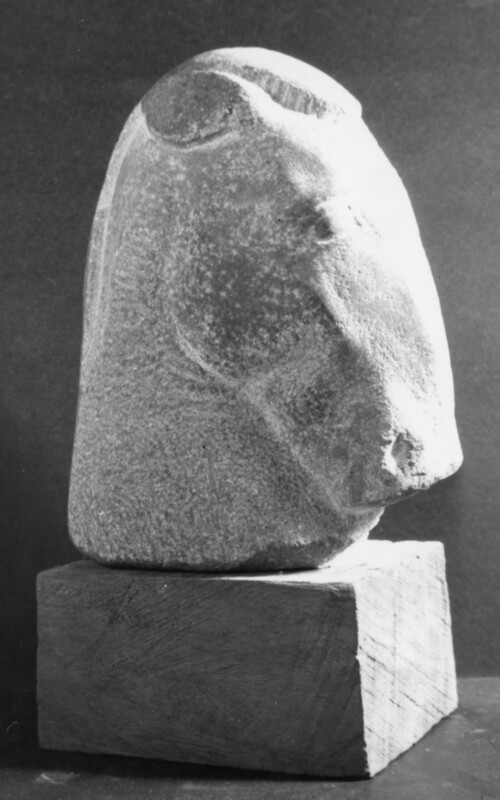 The list shows a “Pony’s Head” by Rosamond Sears but doesn’t list it as carved granite whereas six other pieces are so designated. In askART, a Horse Head is attributed to Rosamond Sears with a photo showing a maquette. 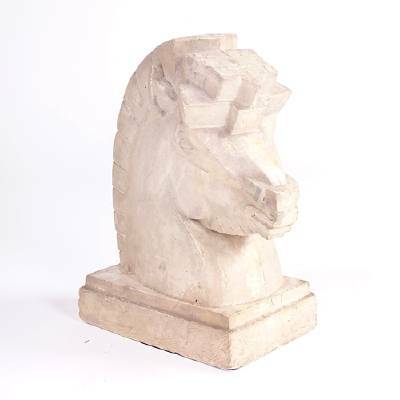 The listing information indicates that it was included in the 1939 exhibition at CAA, however the reviewer clearly talks about a stone Pony’s Head by Allen and never mentions Sears. Although Sears may have finished her piece in stone, a maquette usually indicates a modeled sketch of a piece of sculpture that would likely have been cast in plaster or bronze. Her head is more decorative than “architectural.” The askART listing does not indicate the final medium used for the Sears Pony. Stone is plentiful along the coast of Maine, perfect for a sculptor who likes to be inspired in his work by nature. In the summers, Frederick Allen sculpted for his own pleasure, using for materials the granite and greenstone of North Haven found on the beach of Bartlett’s Harbor on North Haven Island, his summer home, and the pink granite of the sister island Vinalhaven. Ponies characteristically have short heads and small ears, which her pony displays. The Sears work is “cute” and cubistic whereas Allen’s is a mature horse with a large skull. Although the photo of the aged carving does not appear large as the reviewer suggests, upon close inspection, it becomes clear that these three photos are of the same animal.